Being blessed with healthy children and grandchildren, Leduc County utility worker Sel Matthews has been showing his gratitude by raising money for the Stollery Children’s Hospital in Edmonton. This is the fifth or sixth time the 19-year employee of the County has grown a beard only to shave it off five years later. “I’ve had it burned off three times, singed and tarred,” said the father of two and grandfather of four. 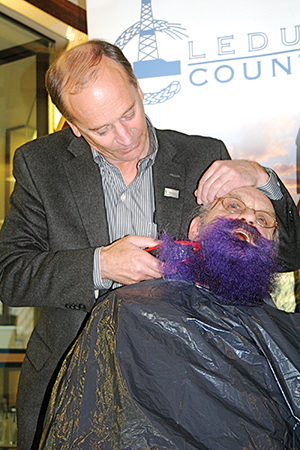 At a shaving ceremony in the foyer of the Leduc County Building in Nisku April 8, County Mayor John Whaley took the clippers to Matthews shaggy purple beard and agreed the County would match the $3,100 Matthews had raised on his own. “It’s a worthy cause, well worth supporting,” he said.